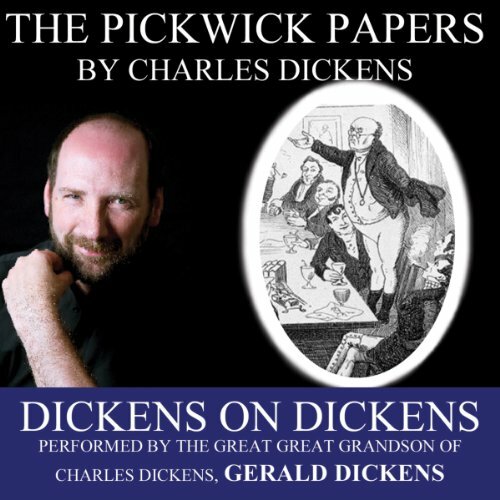 Charles Dickens' first novel, The Pickwick Papers, is here performed by his great, great grandson Gerald Dickens. The members of the Pickwick Club travel throughout the English countryside by coach and report back on their findings to the other members. The novel includes many memorable characters involved in numerous comical misadventures. This was the first Dickens novel I read back some decades back. Even as a young boy, I fell in love with the absurd Pickwick Club members and fell in love with it again as a middle aged man as an audiobook. What makes this book a truly special listen is the totally over the top performance by Gerald Dickens (the author's great great grandson). Especially delightful is his rendition of Sam Weller (Pickwick's manservant) and his father. Be warned though, because this was Dickens' first novel, and like the others a serialized one, this one is a baggier monster than many of his others. There are a lot of chapters which are little more than just experiments in absurd story telling from one character to another and do nothing to advance the plot, but the plot, and its advancement, are really of little consequence in this book. This is just a master learning his craft, and doing his absolute utmost to wring laughs from his reader. You will laugh and even when you groan over the long Dickensian wordplay (meant to earn more money since the pay was by the word) at times, you will find yourself grinning foolishly more often than not. This is not the best Dickens novel by any measure. It is a loose comic construction and its main virtue is that it is just a hell of a lot of fun. But sometimes, because that is what novels can do better than any other entertainment form, that is more than enough. I have Gerald Dickens' other readings of his ancestor's work. I hope he does them all eventually.